This is something I felt like doing to combine my interest in voice acting and Sonic the Hedgehog. The Blue Blur, the Leader, and the fastest of Team Sonic. Heh, think I'd miss this?! 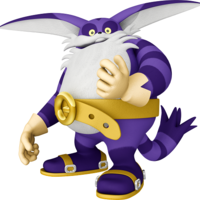 Time to crack that Eggman wide open... Yeah, let's party! Heh. Because... we're Sonic Heroes! Anytime you want a rematch, just let me know. I'll be waiting. Alright! Our next adventure awaits us, so there's no time to waste! Yeah! We're SONIC HEROES! 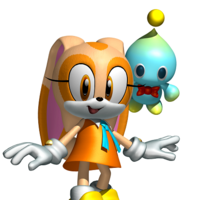 Sonic's best friend, and the member of Team Sonic that can fly. This time you won't get away! 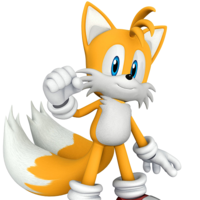 A friend and rival to Sonic, and the brawn of Team Sonic. No worries, we've got this one. Come on, tell me you weren't scared. If it wasn't for us, you wouldn't of had a chance! Sonic sure has his hands full. 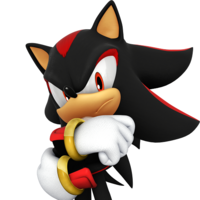 A mysterious rival to Sonic, the Leader, and the fastest of Team Dark. Hmph! Hope you can keep up with me! 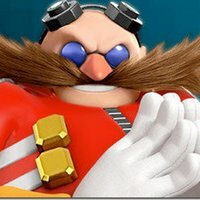 So that Eggman is behind all of this. Hah, some things never change, do they? A mysterious thief who serves as an ally to Shadow. 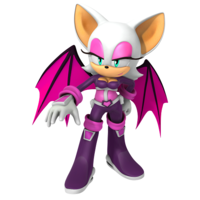 She's the member of Team Dark that can fly. This must be it! I've found Eggman's secret treasure! You guys don't fool me. I know what you're after! Better stay outta my way! All this for what? Nothing! 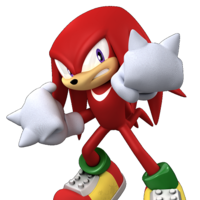 I might as well go look for that Master Emerald, since that irritating echidna is here. 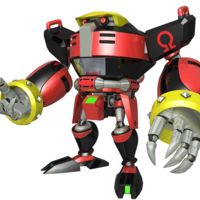 A robot in the E-100 series who joins up with Team Dark. He's the brawn. Primary target detected. Destroy Dr. Eggman. Sensors locked on Eggman. Non-compliant intruders will be destroyed. You know about cloning... The original must exist somewhere. 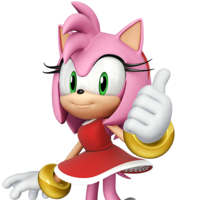 A girl who has a HUGE crush on Sonic. She's the Leader, and the fastest of Team Rose. Ahh... I wonder where Sonic is? Aha! I gotcha, Sonic! SONIC!! A little girl who is a friend to Amy in this particular story. She's the member of Team Rose who can fly. Amy, please be more careful with our only clue. I betcha you're the ones who took Chocola-Chao. Hey, isn't that mister Sonic over there? A lone cat who is still hunting for his companion, Froggy. He's the brawn of Team Rose. It's not nice to tease my friends. 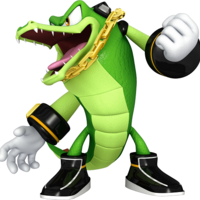 A crocodile who serves as the one in charge of Team Chaotix. He's the brawn. Espio, don't be silly. Besides, you know our policy! We never turn down work that pays! Good job, boys! Guess that Eggman was a fake after all. Some nerve promising what you ain't got! 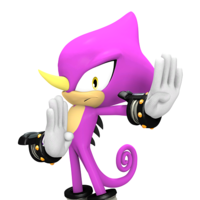 A ninja who is the wisest and the fastest of Team Chaotix. Definitely an agent... a relative, perhaps. 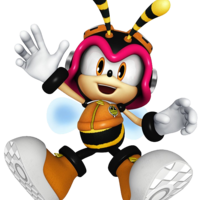 The youngest member of Team Chaotix. He's the one who can fly. It's here, it's here, we've got work! Yeah, time to rock 'n' roll! But what about our money? An evil scientist who serves as the villain for this story. Muhahahaha!! 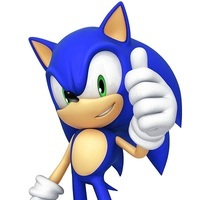 Guess what, Sonic Heroes... I've finally developed the ultimate weapon! In three days, I'll conquer the world. Think you can stop me? Ahahahaha!! Muhahaha... you fools must all have a death wish? Witness this invincible battleship, built by the hands of a genius. Its power... unmatched throughout the universe! 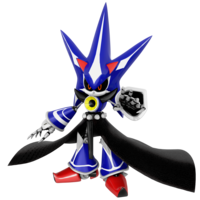 A robotic version of Sonic who is the true villain. All life form data... successfully copied. Hmmhmmhmmhmm... All living things kneel before your master! It's no use... but why can't I defeat you?